The year 2018 was a year. Here are some of our favorite things from the year that was 2018. Atlanta United winning the MLS Cup, at home, in their second year of existence. America’s women’s hockey team beating Canada to win gold at the winter Olympics. Phish summer tour. My first time seeing them three nights in a row. That they never repeated a song during that stretch was notable but not terribly surprising. What was remarkable and never received the treatment at this site that it deserved was the overall quality of the performances, especially on Friday, August 3 but really consistently throughout the weekend, where a wide array of songs from across their thirty-five-year catalogue provided launching pads for fresh, collaborative jams time after time. It feels like the band has reached a new level. Hamilton College’s Francis Baker, the American hockey goalie who stood up to Hitler. This was your most-read story posted on this site in 2018. Steve McNair: Fall of a Titan. This, from Sports Illustrated, was my first foray into the true-crime podcast genre. The gist: what we were told was an open-and-shut case probably has a lot more to it than what the investigating police department allowed to meet the public eye. Story had some additional resonance for me because I had been living in Nashville at the time. Maryland-Baltimore County beating Virginia to become the first-ever sixteen seed to beat a one seed in the NCAA men’s basketball tournament. Justify‘s dominant Triple Crown achievement. Baseball Hall of Fame adding Alan Trammell. Still no Cooperstown spot for teammate Lou Whitaker, though. The Supreme Court clearing the way for states to authorize sports wagering. J.R. Smith delivering the most memorable moment of LeBron James’ final series with Cleveland. Shohei Ohtani making his major-league debut. The Vegas Golden Knights reaching the Stanley Cup Final in their first year of existence. Baseball Prospectus revised its flagship bating metric and now concedes that Miguel Cabrera, not Mike Trout, deserved the 2012 and 2013 AL MVP awards. Tiger Woods winning the PGA Tour Championship at East Lake. In personal news, I published my first article at Baseball Prospectus, which took a look at whether MLB teams were colluding to depress player wages. Thank you for your readership this year. Look for more great content here in 2019. You may have heard that LeBron James will be returning as a member of the Cleveland Cavaliers next season. He announced his decision in a first-person Sports Illustrated post last week. While sportswriters generally fell about the place in sharing how emotional they thought James’ letter was/made them, no one seems to have examined James’ history recitation with any care. James said that “Miami, for me, has been almost like college for other kids.” Did they offer a course in American Athletic History there? If so, can someone leak us the syllabus? Unless James plans to suit up with Johann Von Football and defend Akron’s 1920 APFA title, it’s difficult to understand what James is talking about. The context of that final quoted sentence clearly indicates James is referring to the Larry O’Brien trophy. That’s the trophy they give to the team that wins the NBA championship. The Cleveland Cavaliers have not ever won the NBA championship. They only even made it to the finals once, in 2007, when the eternal Spurs swept James and the Cavs. You can handle the math from here. Following the San Antonio Spurs’ dominant win over the Miami Heat in the NBA finals, FiveThirtyEight decided to examine whether the popular narrative about the winners and losers– that the Spurs played a more complete, team-oriented style of basketball the Heat, increasingly reliant on their solitary superstar, could not combat– was borne out in the numbers. They did this by comparing the relative usage rates (USG%) of the teams’ lineups. Plotting the difference in USG% between each team’s “top” player, the one who “used” the most possessions to either shoot, be fouled, or commit a turnover, and each successive player, should show how well the team spread the ball around. A team that did a good job of sharing the ball should plot a flatter line than a team that did not. FiveThirtyEight’s chart supported the popular narrative: San Antonio’s line was flatter than Miami’s, and the league average, while Miami’s line topped both. As FiveThirtyEight pointed out, this isn’t how NBA championships are supposed to be won. As much as the Heat’s assemblage of its “big three” was seen as groundbreaking, it fit the narrative that grew out of Michael Jordan’s Bulls and Kobe Bryant’s Lakers (and certainly existed before Phil Jackson coached both of those teams to multiple championships) that the NBA was a star-driven league, and the way to win championships was to have a superstar. The Heat simply presented as an extreme version of that reality, with little in the way of supporting cast members. FiveThirtyEight only compared this year’s teams, but the article made me wonder how the last NBA champions who deviated from the star-heavy model– the Detroit Pistons team that won it all exactly ten years ago amidst a solid run– compared statistically to this year’s Spurs. For perspective, keep in mind where the Spurs’ line– red on my chart, black on the one above– is situated relative to the rest of the (2014) league. 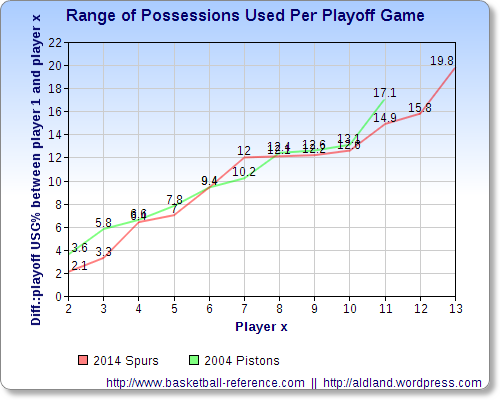 It seems these Spurs and those Pistons were on the same page when it came to playing team-oriented basketball. Meanwhile, Miami is discussing adding Carmelo Anthony for next season. Anthony has been in the top ten in the league for USG% in nine of the past ten years. 1. 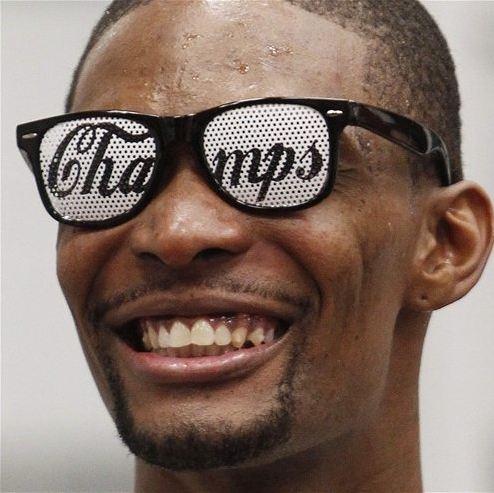 It was just last Thursday that the Miami Heat claimed the 2012 NBA championship with a blowout win over the Oklahoma City Thunder, yet it feels like it could have been six months ago. Maybe that’s because I don’t follow the NBA that carefully, but I get this feeling with nearly every passing major sports championship, and I remember it even as a kid, so it isn’t a feature of a developing perspective on time with age. It could be that the media mediates our experience of sports more than we realize. Hyperanalysis of championship games and series builds so much anticipation and tension. By the morning after the clinching game, though, the championship really does feel like yesterday’s news. Absent a controversial happening during the game, the media typically offers little beyond a standard game breakdown and an interview with a player or coach before jumping right into previewing the next season. There’s never been any question that LeBron James is a great basketball player. And even when he was coming up short in the playoffs, haters like myself just used those failures as an easy excuse to pile on him further, because he’s a dipsh[–] and he deserved it. The fact that he’s won a championship doesn’t fundamentally alter his character in any way. That’s the great con of sports: the idea that winners win because they have character and losers lose because they don’t. If you think LeBron is a good guy now because he won a title, then you probably had no business thinking he was a bad guy to begin with, because the outcome of a sporting event says nothing about the person within. Please ignore the video uploader’s errant comma and make like Mike Miller and don’t let your troubles keep you from having a great weekend.